Home / School of Law News / News 2017 / Sai Balasubramanian, J.D. Class of 2017/M.D. candidate gives TedX Talk "Innovation in Healthcare: How Far Should We Go?" The 21st Century has seen significant advances in patient care, while raising profound questions regarding the intersection of healthcare and innovation. 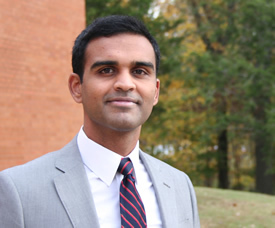 Sai Balasubramanian, Class of 2017 J.D., explores the complex bioethical questions and frameworks that emerge alongside medical innovation. Sai is originally from Dallas, Texas, and is currently an M.D./J.D. dual degree candidate. His areas of specialty outside of clinical medicine include corporate governance, healthcare administration, and health policy. In his previous career in strategy consulting, he advised large corporations on how to optimize their business, compliance, and profitability standards. Sai enjoys speaking and writing about healthcare, law, and management related topics.